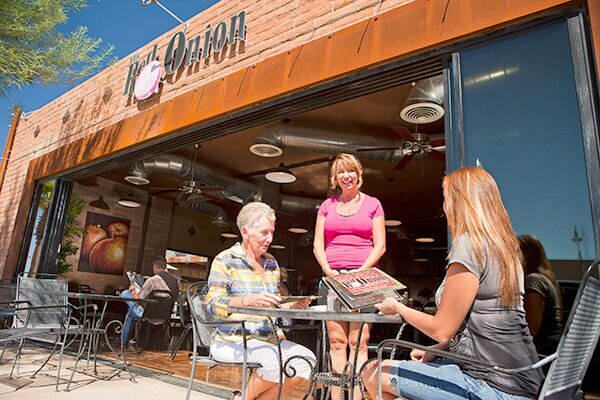 Eat, drink and enjoy at 140 locations in Lake Havasu City! Discover the diverse highlights of Lake Havasu City’s culinary scene. Encounter a chef who was featured on the Cooking Channel, award-winning micro brews, a Top 10 brunch location in Arizona, and a recipient of Wine Spectator’s Restaurant Award. Here, flip flops are welcome everywhere, skateboarders deliver pizza along the Bridgewater Channel, restaurant parking includes docks and beaches, and deli sandwiches can be especially wrapped for your lake or off-road adventure. From the Downtown District to the water’s edge, whether you decide to dine indoors or out, you’ll always find the perfect seat under these open desert skies for pairing relaxation with stunning views. Download our Dining Guide, browse our restaurant categories below, or search for restaurant options everyone will enjoy. Cheers to you and to an unforgettable dining experience, no matter which table you choose!